Around 65 homes and businesses in the village can now place an order for the technology, which is capable of ultrafast speeds up to one Gigabit per second (1Gbps), thanks to the programme led by Durham County Council. 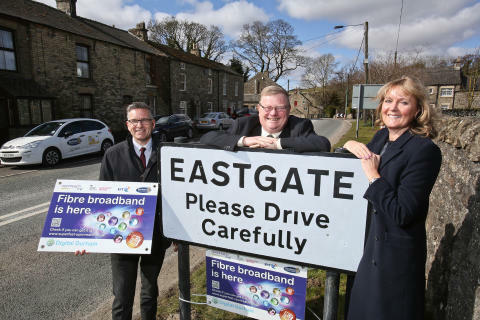 Eastgate is the first community in Upper Weardale to benefit from ultrafast speeds, with around 145 premises in Tow Law, Crook, Thornley and Lanchester, upgraded earlier in the roll-out. Communities have been connected up using Fibre to the Premises (FTTP) technology – where fibre optic cables are run all the way to people’s homes, providing a more reliable network and enough speed to stream 200 HD movies simultaneously. More than 3,500 premises across Upper Weardale can now upgrade to fibre-based broadband rolled out by engineers from Openreach, the business responsible for Britain’s largest phone and broadband network. Locations include parts of Cowshill, Frosterley, Rookhope, Stanhope, St John’s Chapel, Wearhead, Westgate and Wolsingham. A further 460 premises are set to follow in Witton Park, Fir Tree, Stanhope and Satley village, with work underway to provide access through a range of fibre-based technologies. In total, more than 72,000 County Durham homes and businesses can now access fibre-based broadbandrolled out as part of theDigital Durham programme. Nearly half of those who can, have chosen to upgrade to fibre-based broadband, but that still leaves many people in the slow lane, who could be benefitting from faster speeds. Derek Richardson, Openreach programme director for the North East, said: “Reaching very rural communities can be a real challenge. Frequently it requires innovative engineering and increasingly the use of Fibre to the Premises technology in communities unsuitable for the standard roll-out approach. In total, £34 million has been invested in Digital Durham by BT Group, Durham County Council, the Government’s Broadband Delivery UK (BDUK) programme and public sector partners in Gateshead, Sunderland, South Tyneside, North Tyneside and Tees Valley. The second phase of the programme is well under way and by the end of the roll-out 98 per cent of County Durham will have access to fibre-based broadband.